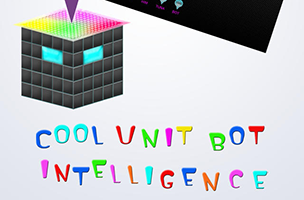 Independent game developer GanaLila has released its free word game on iOS, C.U.B.I.P.L.E.X. The game sees players helping a “next-generation AI machine” named Cubi grow and learn through playing games. Cubiplex is similar to Boggle, as players are given a grid of letter tiles, and must connect these letters into words of varying lengths to earn points. While the basic design is similar, Cubiplex is ultimately more complicated than Boggle, as each square has six letters (one for each side of the cube). Users can rotate these squares individually, or can tap a button to rotate all cubes in a random fashion. Each side has a different letter and a different color, with some colors being worth more than others, even if the letters are the same. Players have five minutes to create as many words as possible, and words must be three letters or more in length. Gamers earn bonus points when creating words with three or more like-colored tiles in a row. Users can share their best scoring words with friends, and are encouraged to keep playing the game to unlock in-game badges and milestones. Cubiplex will grow over time with a two-player mode and “several exciting features” over the coming months, but the base game is now available to download for free on iOS. Check back soon to follow the game on AppData, our tracking service for mobile and social apps and developers.